The mountain scenery around the Jackson Hole valley is quite mind-blowing and this spreading region has quickly become one of the most upscale and captivating tourist destinations in Wyoming. 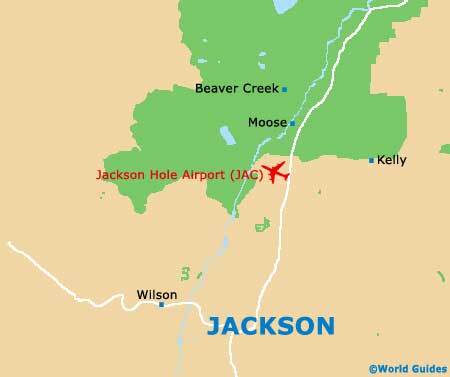 Jackson itself is actually a popular town, which is situated within Jackson Hole and where much of the area's actual Old West heritage is to be found, with mountain views from almost every corner. Summer visitors can enjoy a multitude of outdoor activities, ranging from hiking and biking around the Teton Mountain Range, to white-water rafting on the Snake River. However, come winter, the tourism scene changes dramatically, with the region becoming a winter paradise and offering unbeatable downhill skiing, particularly around the Jackson Hole Mountain Resort, which is now one of America's leading ski destinations. For tourist information, the Jackson Hole Visitors Center offers a good starting point and is located on the northern side of the town center, on the North Cache Drive (Wyoming Centennial Scenic Byway) and close to the West Broadway Avenue. Hordes of tourists come to Jackson Hole each year to spend time exploring the vast Grand Teton National Park, which is just a matter of minutes away and to the north. The Grand Teton National Park features a virtually limitless selection of hiking trails, which stretch for miles around the glacial peaks, along with a good visitors center within the town of Moose. Away from the park, the National Elk Refuge is something quite unique to Jackson Hole and home to literally thousands of elk, while further recreational activities await within the Bridger Teton National Forest and the Hoback River Canyon. 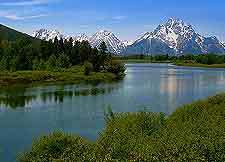 More information about Jackson Hole Tourist Attractions and the Grand Teton National Park. Downtown Jackson is where you will discover a number of historical landmarks and unusual sights, especially around the Town Square next to Deloney Avenue, where tourists are greeted by huge curving arches made of nothing but collected elk antlers. Prominent natural sights very greatly and include lakes, rivers and past landslides, with much of the surrounding scenery being dominated by the Teton Mountain Range. 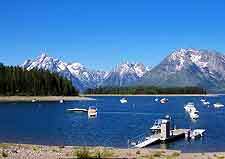 Within the Grand Teton National Park, the Jackson Lake is one of America's largest high-altitude lakes and has become a good place for a spot of wild trout or salmon fishing. 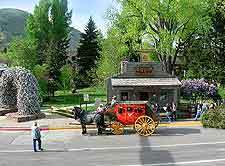 More information about Jackson Hole Landmarks and Monuments. The museums of Jackson Hole cover various different topics, providing information about local history and mountain wildlife, while for children, the fun-packed Ripley's Believe It Or Not will always be a winner. What most tourists don't realize is that Jackson Hole boasts a thriving arts scene, with in excess of 50 art galleries within Jackson town, and plenty more close by. Paintings of local scenes often make a very good vacation souvenir, although if you are simply looking to appreciate some find art, then the vast collection of pieces at the acclaimed National Museum of Wildlife Art really stands out. 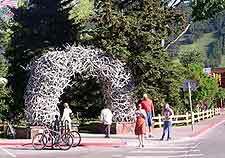 More information about Jackson Hole Museums and Jackson Hole Art Galleries. Many day trips are possible using Jackson Hole as a base, with some world-class tourist attractions being within relative proximity. These include the Caribou Targhee National Forest, where the Palisades Reservoir is surrounded by camping sites and features a range of water sports. However, if you have a few spare days, then head north of Jackson Hole and past the Grand Teton National Park, where the Yellowstone National Park is simply so vast and well signposted, that it is impossible to miss. Most people come to the Yellowstone National Park to see the geothermal springs, with the famous Old Faithful Geyser being almost legendary. 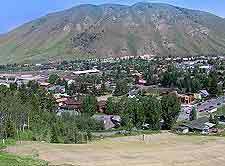 More information about Jackson Hole Attractions Nearby.